We’ve compiled a few frequently asked questions about the new app and how you can take advantage of all the new features in the new app and on Flightradar24.com. If you have a question not addressed in the FAQ, get in touch with us and we’ll be happy to help. Can I keep using my Premium app? Yes, but we recommend downloading and installing our new app, available for iOS and Android. With the new app you will get more information about each flight and more features. After downloading, just log in to begin enjoying the features available with your subscription. Can I keep using my Free app? Please update your existing free app to get the new app with many new features and much more flight data. Can I keep using my Pro app? Yes, you may continue using the Pro app and any previous in-app purchases, but the Pro app will no longer be updated. Please download the new app to take advantage of additional flight data and new features. The new app is available for free, but you can upgrade for even more features in the app and on the web. We offer a free trial for all of our Flightradar24 subscriptions, perfect for trying out the features to see which are right for you. Can I have the old Pro app and the new app installed at the same time? If I download the new app, will it overwrite my Pro app? No, the Pro app and the new app are separate and can be installed and used in parallel. The new app was previously the free app. Can I transfer my alerts or filters from Pro app to the new app? Because the new app is a separate app, it is not possible to transfer alerts or other settings. Can I transfer the in-app-purchases from the Pro app to the new app? It is not possible to transfer in-app purchases, but you may continue to use those purchases in the Pro app. We recommend downloading the new app to get even more flight data and all of our new features. We offer a free trial for all of our Flightradar24 subscriptions, perfect for trying out the features to see which are right for you. If you have any questions about your existing Pro app, get in touch with us. I have web subscription, do I need another subscription to use the app? No, your Flightradar24 subscription is available on the web and in the mobile app. Just log in on the device you’d like to use. See all of the features available as part of your subscription. If I buy a subscription in the new app, can I use it on web as well? Absolutely, the new app and web are sharing the same subscription plans. See all of the features available as part of your subscription. Is it possible to get the features in the new app with just a one-time payment? The new app offers a lot of additional features for free and even more features are available with a Flightradar24 subscription. Our Silver subscription is just USD 9.99 per year and offers no ads and other additional features like more labels and historical data. All subscriptions and their features can be used in our mobile app and on the web at Flightradar24.com. We offer a free trial for all of our Flightradar24 subscriptions, perfect for trying out the features to see which are right for you. I can’t find the Pro app in the store? The Pro app is no longer available for download. If you have previously purchased the Pro app and would like to restore it to your device, instructions are available here. 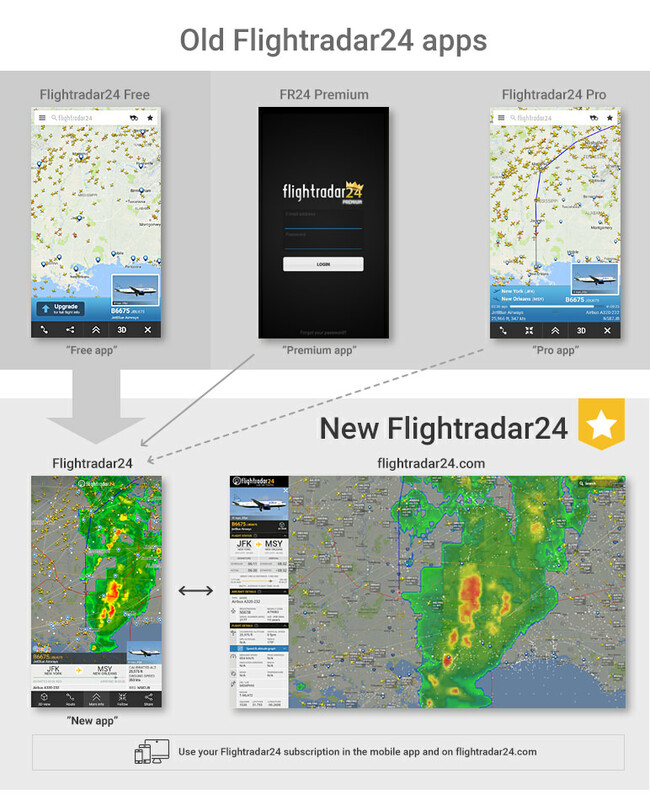 The Flightradar24 mobile experience was 3 separate apps, which was confusing for many of our users. We decided to merge features from our 3 apps into one and add most of the features from the web to make just one app with subscription plans shared between Android, iOS and web. Why did you update the free app and not the Pro app? The free app had many more users, so by updating the free app to the new app we added new features to the app for free, enabled subscribers to take advantage of features across platforms, and also made it possible for our Pro users to keep using their existing app alongside the new app. What are the benefits of downloading the new app? The new Flightradar24 app has been rebuilt from the ground up with many new features from the new Flightradar24 website included. Features like weather layers, aeronautical charts, flight history, aircraft on ground, and Extended Mode S data that weren’t possible to add to the old app are now available. We’re already working on some great new features for the app and updates will be released regularly with new features and include updated data like to airports, airlines, and airline logos as they are added to our database.